I polled Twitter last week and asked which vegan treat did people prefer: cookies, cupcakes, pie, or cake. Surprisingly, cookies won by a landslide. I see so many vegan cupcake recipes online that I was sure that people would pick those. Personally, I love cookies and would have picked them as well if I had been the one to be polled. I’m not even really particular about a particular kind of cookie either because honestly, I’ve never met a vegan cookie I didn’t like ?. I knew I wanted to make a sweet treat for Valentine’s Day and since cookies won the poll, I decided to make cookies. See? You want it and I make it for you. Poll time! Which #vegan treat do you prefer? I have a recipe for a vegan chocolate chip cookie that’s super easy to make, so I decided to use it as my base. I had everything I needed but the chocolate chips, so off to the store I went. I live in a small town with a few stores that carry vegan chocolate chips, so I wasn’t worried that I wouldn’t be able to find them. I stopped off at a TJ Maxx on my way to buy chocolate chips and happened upon a large bag of organic cacao nibs for a really good price, so I snatched them up. I decided I would use those in place of chocolate chips. Now that I had everything I needed, I headed home. My wife loves spicy food. If a dish has a hot pepper or hot sauce in it, she’s happy. 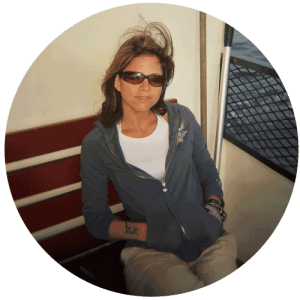 Even though we’ve been together for 19 years, we’ve only been married for a few months. So technically, this will be our first Valentine’s Day together as a married couple. It’s kinda cute to start celebrating firsts again ? I thought that I would try my hand at making her a spicy cookie as a special Valentine’s Day treat. Using my basic chocolate chip cookie as a base, I added healthy dose of cayenne pepper, cinnamon, and a dash of cocoa powder. I didn’t know it at the time but this is a classic combination in Mexican Hot Chocolate cookies. Brilliant! I also used himalayan pink salt in place of regular white, soymilk in place of almond milk, and a tiny bit more molasses because molasses is good. What I was left with was a very dark, very thick batter. Come on! 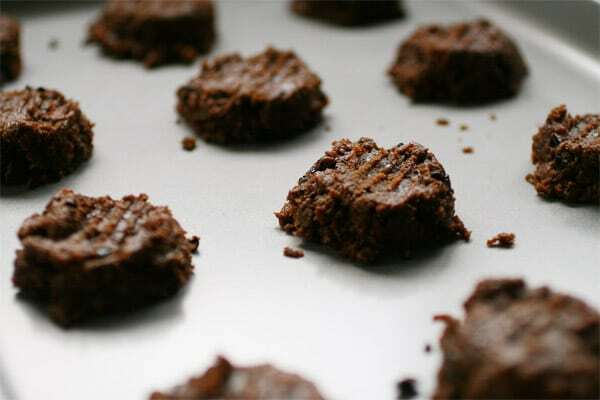 These Vegan Spicy Cinnamon Cayenne Cacao Cookies look amazing, right? The end result was a nice thick cookie that wasn’t as dense as you might think. They’re not overly sweet and have a great depth of flavor. Fair warning, these are pretty spicy. I don’t think it’s too much, but I like spice. If you don’t care for a lot of heat, you can half the amount of cayenne pepper that you use. The cacao nibs add a nutty chocolatey taste that I absolutely love, I’m so glad that I stumbled upon them and decided to use them over chocolate. But if all you have are chocolate chips, by all means use them. You’ll get a delicious cookie either way. 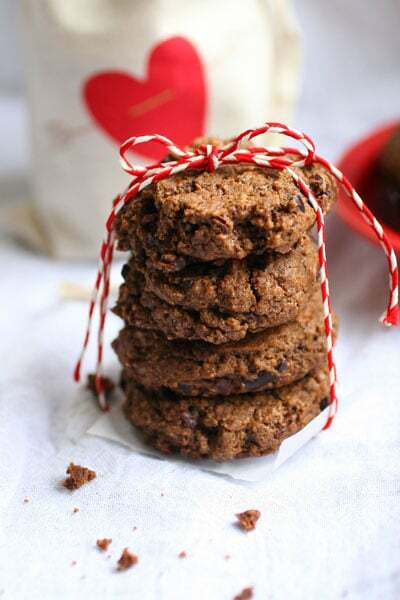 I try not to play favorites when it comes to cookies, but if I did these Vegan Spicy Cinnamon Cayenne Cacao Cookies might top the list. I served them up to my wife (in a little linen heart gift bag because, hello adorable) who proclaimed them to be the perfect “adult cookies” – and she’s right. 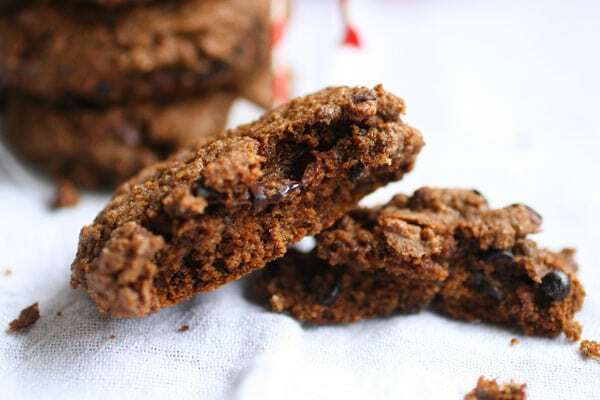 They’re not your average everyday vegan cookie. 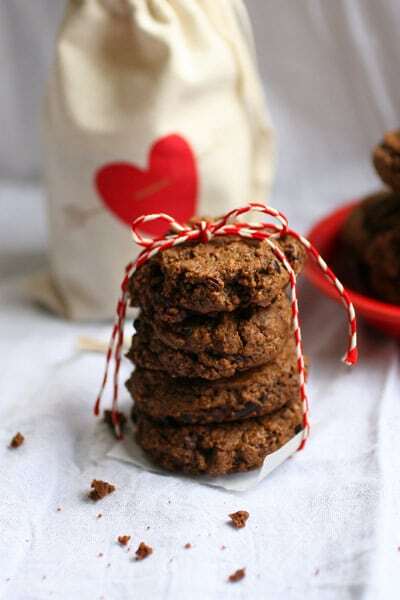 They’re complex cookies with a big kick that pairs excellently with coffee (or rum), and makes an spicy valentine for a spicy someone you love. Place the flour, sugar, baking powder, baking soda, salt, cinnamon, cocoa powder, and cayenne pepper into a bowl and mix together until fully combined with no lumps. In a glass measuring cup add canola oil, molasses, vanilla, and soymilk. Whisk together until combined. Make a well in the center of the flour mixture and pour wet ingredients into the well. Add cacao nibs. Gently fold together until combined. Don't over mix the dough. Using a spoon or a cookie scoop, make 16 balls of dough and place on a baking sheet evenly spaced. Use the back of a fork to press each dough ball slightly, creating a cookie shape. Place in preheated oven and bake for 12 - 14 minutes. When the cookies are done, place them on a cooling rack to cool. Makes 16 cookies. If you don't care for a lot of heat, use 1/2 teaspoon of cayenne pepper instead of a full teaspoon. These sound really good. I don’t tolerate a lot of heat, so I would definitely be using the lower end of the cayenne amount, but I do like chilli chocolate, and cinnamon is my favourite spice. These are pretty spicy so I’d cut the cayenne way down to a 1/4 – 1/2 tsp if you don’t tolerate heat well. I like heat, but not as much as my wife does. She could have handled even more heat in them! One of my favorite spice combos is cinnamon and cayenne- I’ve even put it in my morning oats before. I learned how to make peach pie this summer with just a handful of ingredients- maybe I’ll make one and post it for you :) Actually, now that I’m thinking about it as I’m typing…cherry pie sounds really great. Maybe I could make a cherry cocoa pie- have you ever had one of those? So good!